Skating on the Rideau Canal during the annual Winterlude Festival in Ottawa (photo: Canadian Heritage). A view of the very opulent Fairmont Chateau Laurier in Ottawa. 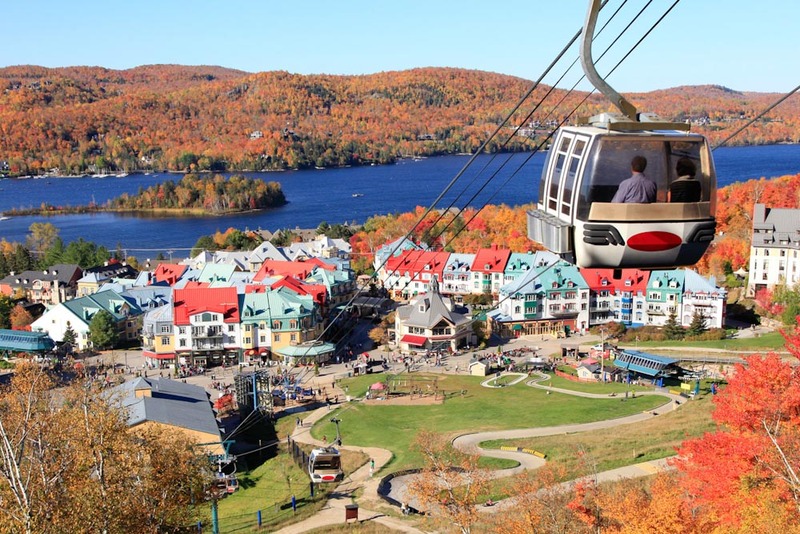 Gondola ride over Ottawa's Mount Tremblant. 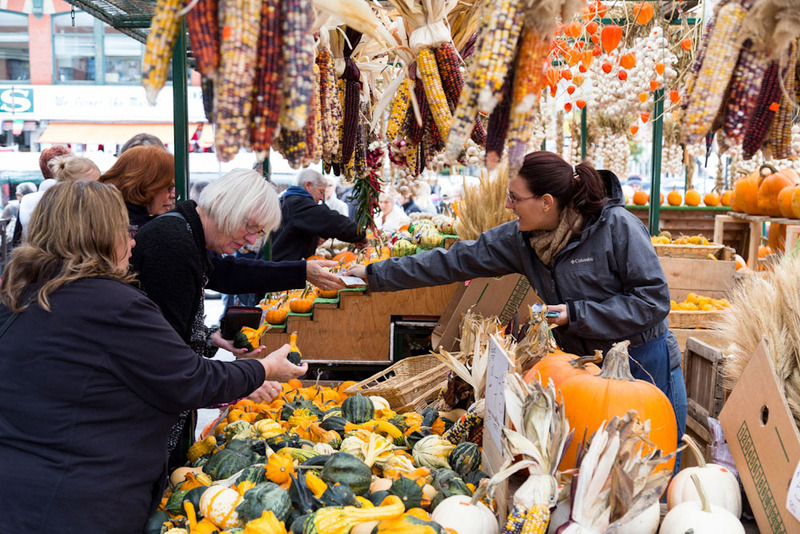 Shoppers busy inspecting the fresh produce at the Byward Market. 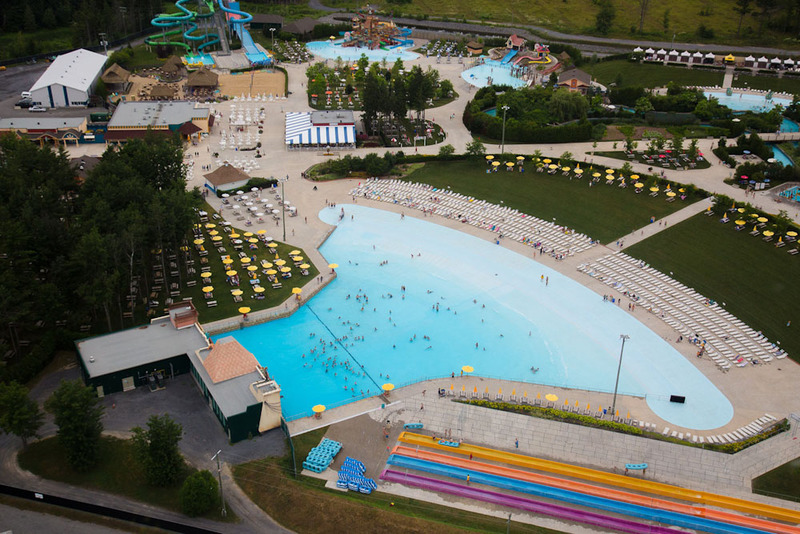 Calypso Park is the biggest water-park in Canada, it's also home to a massive 4,800-square-metre wave pool (photo: Calypso Themepark). 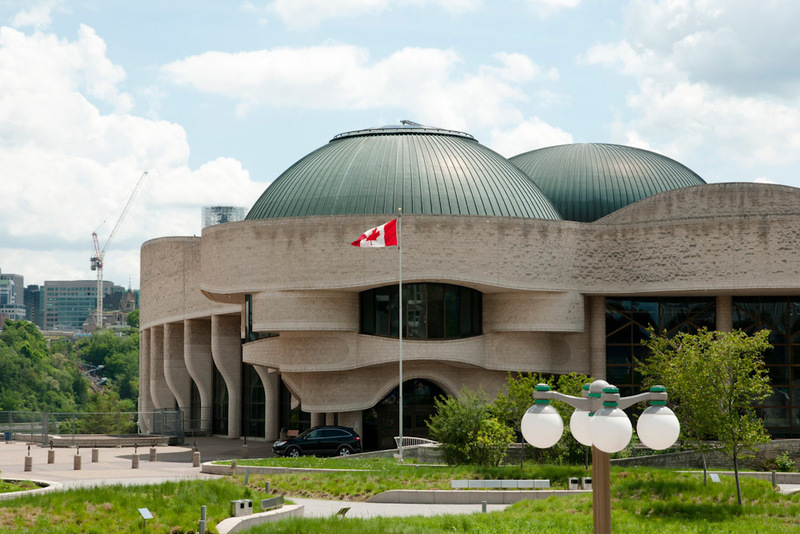 This architecture marvel is the Canadian Museum of History, located in Ottawa. Hitler's Limo displayed in the Canadian War Museum (photo: Robert Linsdell Flickr). Cycling the Capital Pathway network next to Rideau River in Ottawa. The soaring ceiling inside the National Gallery of Canada, Ottawa (photo: Canadian Tourism). 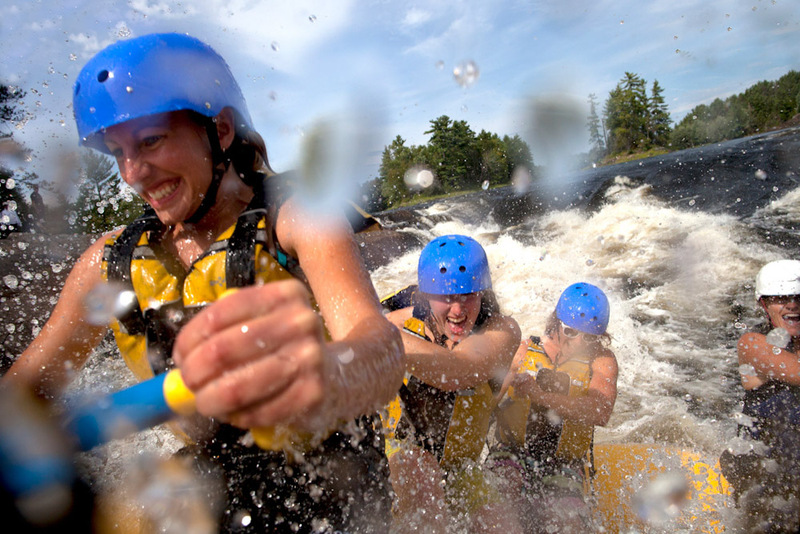 Brave and very drenched adventure seekers whitewater rafting down Ottawa River. 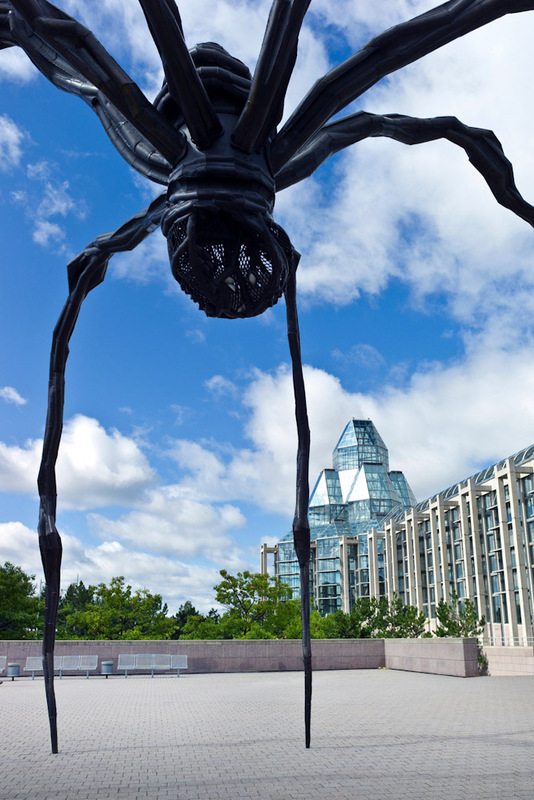 An arachnid-like sculpture in front of the National Gallery of Canada. Scarlet tulips and a proud Canadian flag at the Canadian Tulip festival in Ottawa. Leafy Gatineau Park with a view of Ottawa's Parliament buildings. 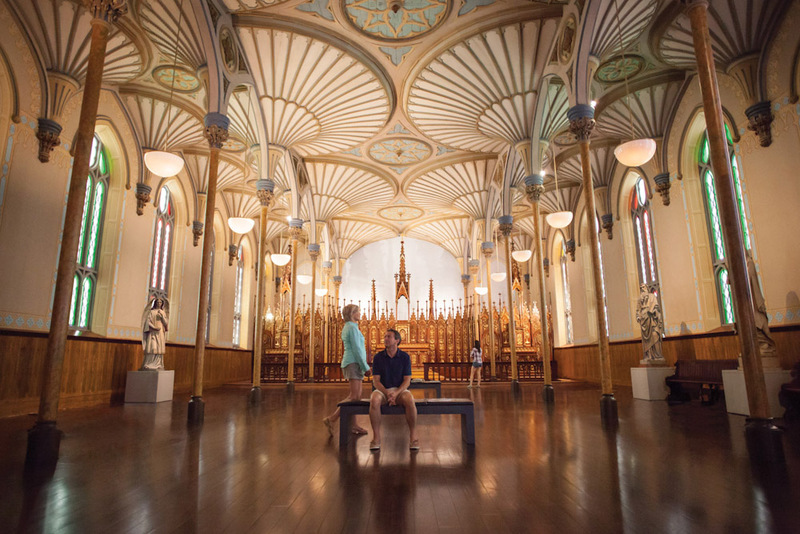 Few national capitals reflect their native lands better than Ottawa, where its mix of culture and nature impresses everyone from daytrippers to visiting royal couples; this is our Undiscovered Ottawa City Guide. By Adam Bisby. As Canada’s capital city, it’s fitting that Ottawa’s skyline is still dominated by Parliament Hill’s iconic Peace Tower. Plenty other trappings of federal and international government are prominent here, such as the Royal Canadian Mint, the Prime Minister’s official residence, and the Governor General’s estate. 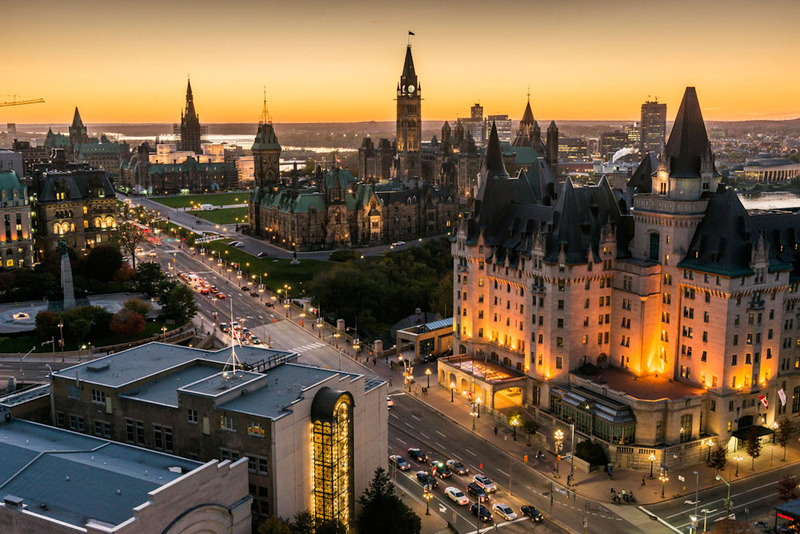 Combine all this history and ceremony with the country’s densest collection of world-class museums, and Ottawa succeeds in making Canadians proud – and visitors a little bit jealous. The aspects of Ottawa that aren’t all about Canada tend to fall by the wayside. Just across the river in Quebec, for instance, leafy Gatineau Park is a hiker’s, cyclist’s and skier’s dream, while the Casino du Lac Leamy is an adults-only playground with gaming galore, top-notch dining, decadent spas and a 1,100-seat theatre. In the city itself, the diversions that get plenty of attention from locals – the beaches and volleyball courts of Mooney’s Bay Park, for instance, or the recently revamped Lansdowne recreation complex – tend to get skipped by visitors. Free elevator trips to the observation deck below the tower’s four five-metre clock faces provide glorious panoramic views of the region from 60 metres up. 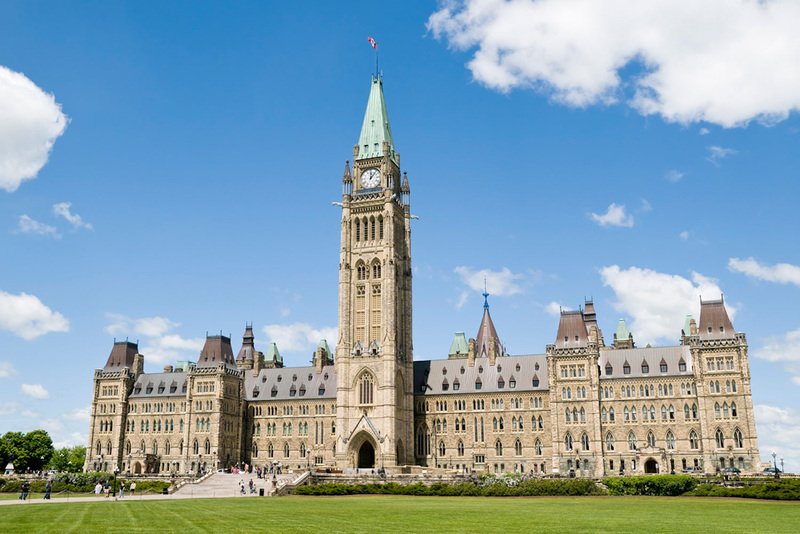 Guided tours explore the Hill’s Centre Block, which houses the neo-Gothic Senate and House of Commons, as well as the ornate Library of Parliament and stirring Memorial Chamber. A short walk from Parliament Hill, this soaring architectural masterpiece is home to six expansive gallery spaces, including a Canadian collection featuring iconic works by the Group of Seven, and a European gallery filled with paintings by geniuses like Van Gogh, Cezanne and Rembrandt. Before it spills into the city’s namesake river via a spectacular flight of eight locks, this 190-kilometre-long engineering marvel and World Heritage Site is lined with cycle paths, restaurants and pubs, parks and gardens, all of which provide ideal vantage points for admiring many of the landmarks on this list. Waterfront holiday homes abound just outside of Ottawa, but you don’t need to own recreational real estate to get in on the action. Lake-filled Gatineau Park is home to dozens of sandy beaches, campgrounds and picnic areas, as well as 165 kilometres of hiking and cross-country ski trails and 90 kilometres of mountain bike trails. There’s even downhill skiing and snowboarding at Camp Fortune. In town, meanwhile, you can take a relaxing dip in ‘The Pond’, a secret swimming hole tucked into the Rockcliffe Park neighbourhood off the aptly named Pond Street. Likewise, you don’t need to go to Gatineau Park for a scenic bike ride. 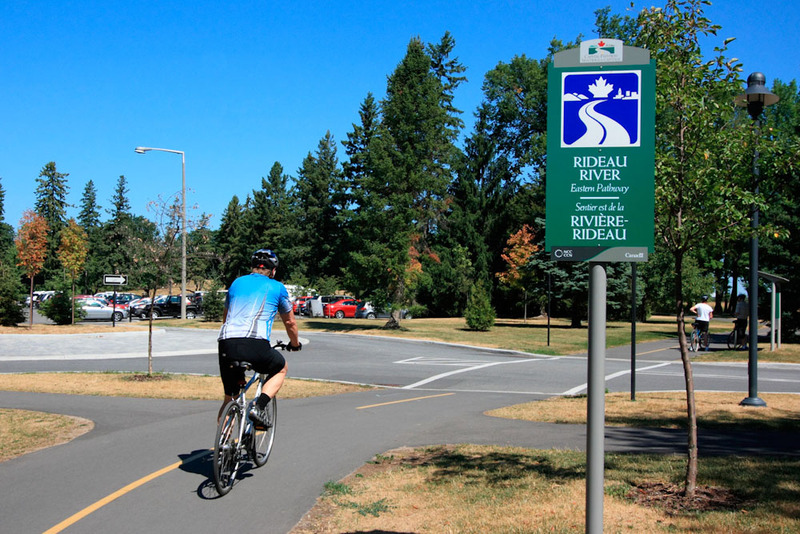 The Capital Pathway network is one of the largest multi-use trails in North America, with more than 600 kilometres of car-free goodness connecting many of the attractions on this list. Why cross the Atlantic to get a taste of royalty when you can sample its trappings at Rideau Hall, the official residence and workplace of Canada’s Governor General? The Queen’s representative in Canada has some pretty sweet digs the that kids will not hate you for: the opulent public rooms and multi-million-dollar art collection will impress grown-ups, while the expansive outdoor grounds, complete with cricket pitch, skating rink and Alice in Wonderland-style Rose Garden, will enthral youngsters. Children will also get a kick out of the changing of the guard – and the towering beaver-pelt headgear worn by the guardsmen. Calypso Park offers a considerably less ceremonial diversion. Canada’s largest waterpark is home to a 4,800-square-metre wave pool – one of the largest in North America – along with 35 waterslides including the 28-metre tall ‘Summit Tower’. Manmade water parks are all well and good, but it’s tough to beat the all-natural equivalent. West of Ottawa the river narrows drastically, creating sections of whitewater ranging from gentle Class 1 rapids to cataclysmic Class 5s. The latter may not look navigable, but local outfitters such as Wilderness Tours and OWL Rafting guide thousands of guests safely down them each summer, albeit with plenty of hilarious capsizes. For daredevils who prefer to stay dry, there’s the Camp Fortune aerial park in the woods cloaking the Gatineau Hills. It features a 20-element Aerial Explorer ropes course, a multi-level Amazone course, and seven zip lines. Convenience and charm collide in the Byward Market, a 26-block shopping district sandwiched between Parliament Hill, the Ottawa River and the multi-storey Rideau Centre shopping mall. It’s home to one of the oldest agricultural markets in Canada, but don’t just expect farmers and fishmongers here. Depending on the season, the market building itself often overflows with stands selling everything from wild blackberries to hand-made bracelets. The surrounding streets, meanwhile, are lined with boutiques, restaurants, clubs and taverns, which spill into a series of open-air courtyards. Bank Street, one of Ottawa’s main thoroughfares, is also the principal artery running through the Glebe neighbourhood south of downtown. Boutiques, pubs and restaurants line the streetscape here, with the multi-purpose Lansdowne Park – home to the Canadian Football League’s football Redblacks – bordering the Glebe to the south and the picturesque, park-lined Rideau Canal marking its eastern border. The stark modern design of the Canadian War Museum evokes a bunker, the grass-covered roof a battlefield, and small windows on a towering rooftop fin spell out ‘lest we forget’ in Morse code. 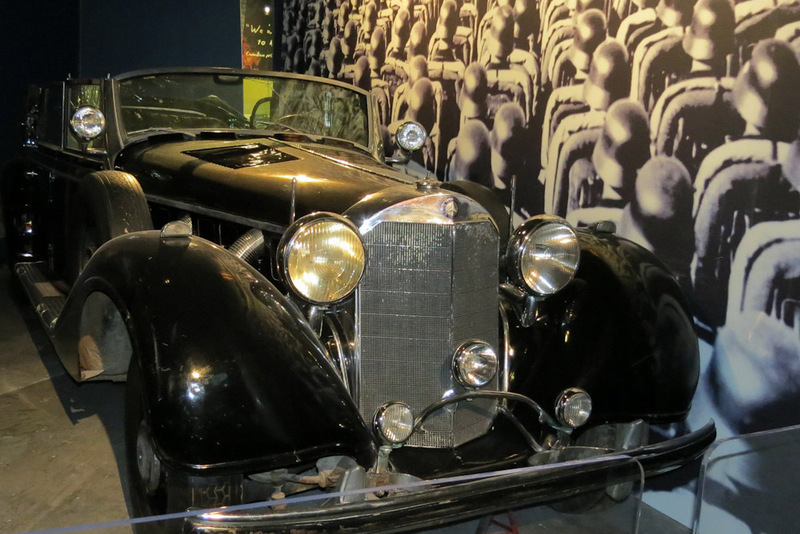 Inside, the permanent galleries display items such as one of Adolf Hitler’s Mercedes limousines, while covering conflicts ranging from First Nations battles and the War of 1812 to the Cold War and Afghanistan. The highlight, however, is the Memorial Hall, a space for remembrance and contemplation containing a single artifact: the headstone of Canada’s Unknown Soldier from the First World War. The multilayered architectural marvel known as the Canadian Museum of History houses four permanent exhibitions, including the First Peoples Hall, which chronicles the 20,000-year history of Canada’s Aboriginal peoples; the whimsical Canadian Children’s Museum; and an eye-popping IMAX theatre. Spread over three weekends in February, Winterlude is Ottawa’s annual celebration of all things winter. 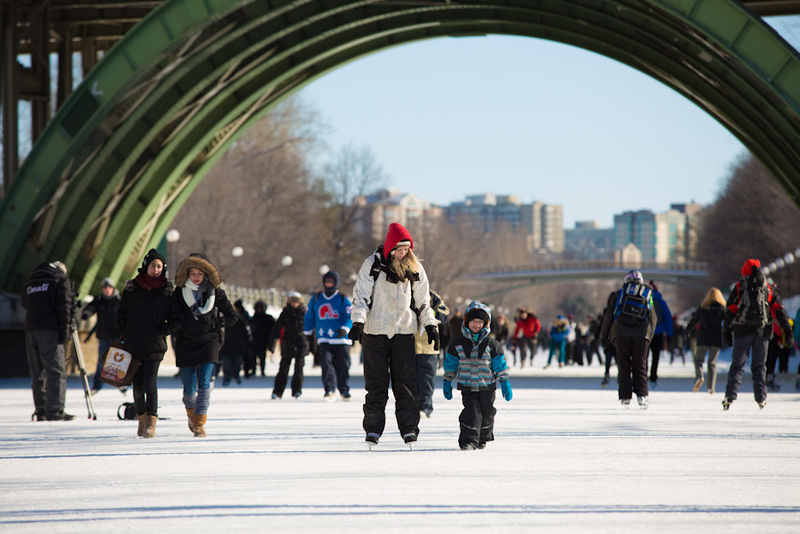 An eight-kilometre stretch of the Rideau Canal is cleared and groomed for skating, with stands selling iconic Canadian refreshments like sugary Beavertails – hand-stretched and fried pastries that you won’t work off in a season of skiing – plus maple fudge and cheese-and-gravy-laden Poutine lining much of the route. Live concerts and other events also spring up on the ice, while parks surrounding the skateway host ice-sculpting competitions, with playgrounds and lounges also carved out of frozen H20. 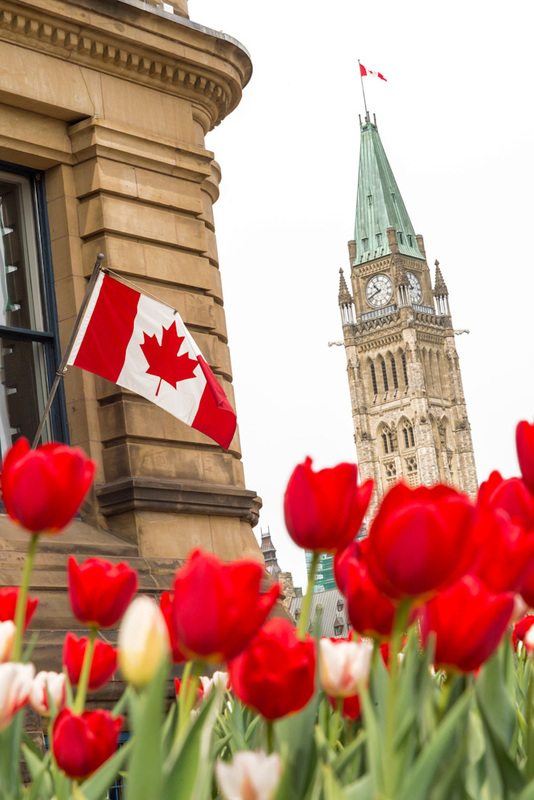 At the other end of the seasonal spectrum is the Canadian Tulip Festival in May, when more than a million colourful blooms draw 500,000-plus visitors, who also get to revel in live concerts, art displays and culinary showcases. The nation turns its eyes to Ottawa each July 1 – Canada Day – and the capital does not disappoint. Indeed, hundreds of thousands of people flock to the capital for parades, live music and more patriotic fun. To top it all off, admission is free to most museums and many other attractions on July 1. A two-hour drive northeast of Ottawa, Mont Tremblant is Quebec’s most complete resort area. Incredible views? Got them, from a gondola or deck chair on Tremblant’s summit. Thrill-seeking? Definitely: multiple zip lines, a downhill luge track, mountain biking, rock climbing… you get the idea. Nightlife? Take your pick from the village’s various clubs and the glitzy mountainside casino. As for wining and dining, you’ve got dozens of taverns, wine bars and eateries. Then there’s the main attraction: skiing and snowboarding, which is consistently rated as the best in eastern North America. 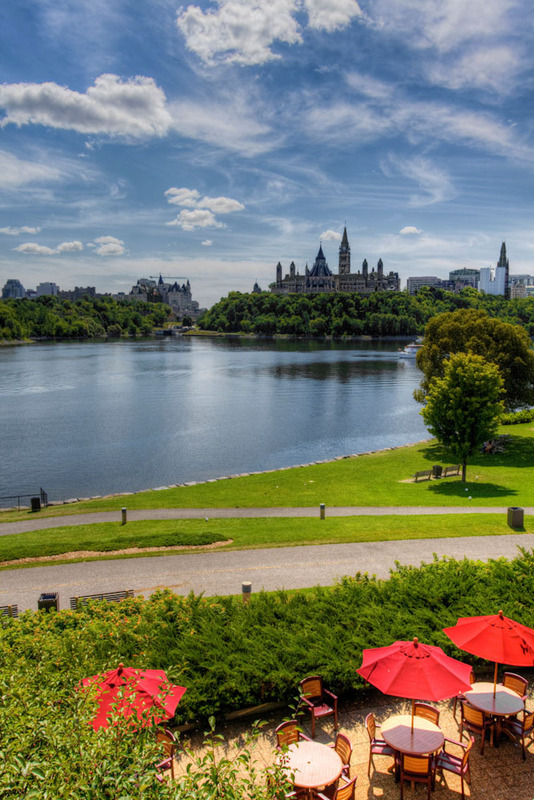 Luxury: Fairmont Chateau Laurier – It’s impossible to beat this opulent Grand Dame’s prime location between Parliament Hill, the Byward Market and the Rideau Canal. Family: Westin Ottawa – Almost as perfectly located as the Chateau Laurier, the Westin features an indoor pool and adjoining family rooms. Comfortable: Lord Elgin – Another piece of prime real estate that’s almost as regal as the Chateau Laurier, but considerably less costly. Budget: Ottawa Jail Hostel – This Hostelling International outpost, housed in a former gaol, is a truly unique experience. Rooms range from dorms and doubles to private spaces barely big enough to stand in. Lieutenant’s Pump: This local favourite on lively Elgin Street pours microbrews by the pint and serves one of the city’s most dependable weekend brunches. Fairouz: Lebanese cuisine is an Ottawa staple, and this eatery in the Centretown neighbourhood puts an upscale spin on dishes like lamb tartar and maslouka. Can’t get enough of Canada?